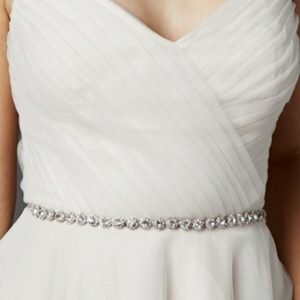 Silver bridal belt with unique links and Genuine crystals wraps almost fully around the waist. 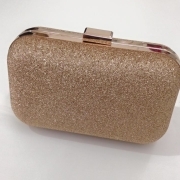 The Crystal section is 53.5 cm long x 1 cm wide. 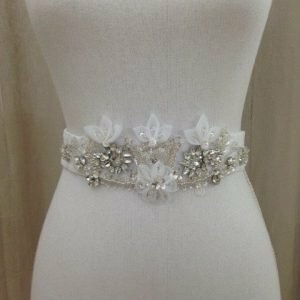 This ivory ribbon sash set in Genuine Silver Rhodium is a must-have addition to any Wedding Gown. 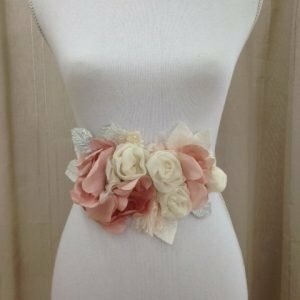 This Pretty Bridal Sash is handmade with silk and chiffon flowers, white and silver leaves and Ivory lace . The sash is satin material and is 232 cm long. The feature flower section is 28 cm long 14 cm wide at widest point. 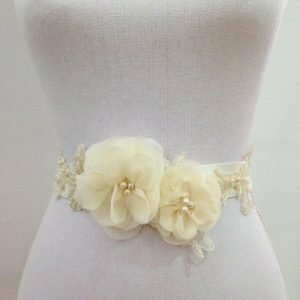 The Beautiful Wedding Dress Sash is handmade with 2 Cream Chiffon flowers and Gorgeous Ivory Lace. 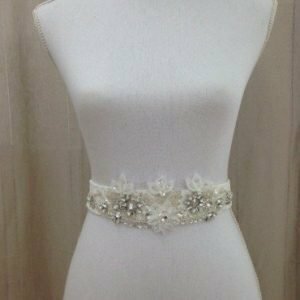 A Stunning Bridal Belt to enhance your Wedding Gown. The sash is 190 cm long and can be tied on a bow. 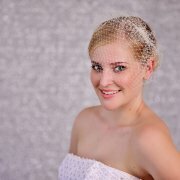 This luxurious white satin and lace wedding sash is the perfect finishing touch to any bridal gown. At 108″ long( 270cm) and 1.7″ wide (4cm). 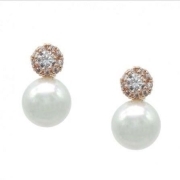 The handmade crystal beaded applique is 12″ wide and 3 .5″ high with an elegant floral design. Behind the Beaded Applique is pretty lace fabric. This luxurious ivory satin and lace wedding sash is the perfect finishing touch to any bridal gown. At 106″ long( 269cm) and 1.7″ wide (4cm). The handmade crystal beaded applique is 12″ wide and 3 .5″ high with an elegant floral design. Behind the Beaded Applique is pretty lace fabric.